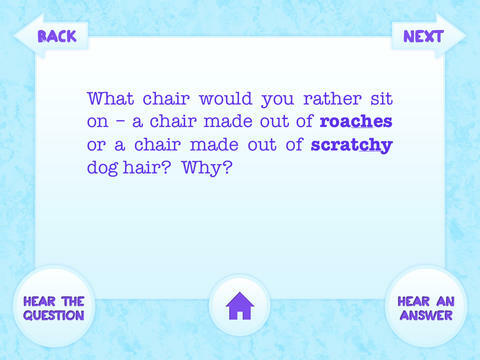 Multiple Choice Articulation is an interactive app for your iPad, iPad mini, iPhone, and iPod touch that features a collection of over 500 multiple choice questions designed for speech-language pathologists to use with individuals who exhibit difficulty producing the following speech sounds: S, Z, R, L, S/R/L Blends, SH, CH, and TH. Tons of content: with just a tap of a finger, children and clinicians can discover over 500 sound specific multiple choice questions that are perfect for the speech therapy setting. Hear the question: each multiple choice question has an exciting narrative audio component to it. Hear an answer: each multiple choice question has an example audio response that children get a kick out of. Child-friendly interface: simple, intuitive, and NO in-app purchases or external links. With over 2 hours worth of silly and thought-provoking audio questions and answers, Multiple Choice Articulation is sure to become one of your favorite speech therapy apps in no time. It is intended to aid in the remediation of articulation impairments, as well as auditory and language difficulties because clients often need practice in more than one area of communication. Many children today do not have solid decision making skills. Children often lack the ability to generate and evaluate options when faced with a challenge. They often wait for adults to point them in the right direction, or worse, to solve the entire problem. This does little for their personal growth and maturity. With this collection of multiple choice questions, students will learn to properly make a decision and verbalize why they made that decision. Having the ability to make decisions empowers children and fosters independence. The multiple choice question format is a departure from traditional articulation drill work. Because of this unique format, clients enjoy asking the multiple choice questions to their friends and classmates outside of the speech therapy room, further practicing their communication skills and thereby facilitating the sometimes difficult stage of carrying over newly-acquired skills. By reviewing the questions with the client, paraprofessionals in the classroom and/or parents at home can reinforce the client’s skills while sharing a fun activity. Practicing communication skills in environments outside the speech therapy setting increases opportunities for generalization of communication skills. Use these questions to spice up your speech therapy sessions. The questions are intended to initiate exciting and lively conversations. Every inquiry has the potential for leading almost anywhere. Even a question that appears simple can trigger a unique thought process and complex response. Regardless of when, where or how these questions are used within the speech therapy session, one thing is certain, children (as well as clinicians) will have a blast giving their responses to the questions . . . and in the process they will continue to practice the correct pronunciation of their sounds at the spontaneous conversation level. Let your imagination run wild and have fun with this therapy material!